Such a perfect day for a London Photo Walk. The sun is shining and light is naturally filtered by soft clouds. Our small group of participants are excited by the prospect of photographing the wonderful monuments and memorials in Trafalgar Square. This photo walk is led by Lou Smith, Fine Art Photographer and expert tutor. Our first stop is Trafalgar Square and today the architecture looks stunning in the light. Everything looks fresh and people in the Square are dressed for the warmth of the day. 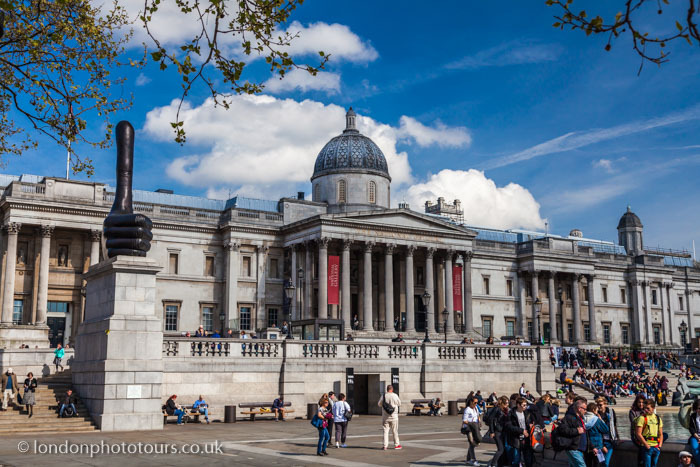 In our photo you can see the National Gallery. The National is home to a fantastic art collection. The Gallery was founded in 1824 and is one of the most visited museums in the world. Photographers flock to photograph this beautiful building. Our small group of students are no exception to this and want to photograph it too. The National has wonderful lines and textures and is very elegant in it structure. Just in front of the National Gallery is the Really Good Statue (the large thumbs up in the photo). This sculpture is sited on the modern plinth and stands in contrast to the traditional architecture of the Gallery. London is like that…lots of juxtaposition of old and new! This is part of the fascination of London and it is what makes the City so fantastic to photograph. We have framed our shot through the trees. We have used this creative technique to add to the traditional feel of the architecture. This also lets us know that London is landscaped with trees. Just outside Trafalgar Square there are lines of green trees through which to frame more subjects. The composition we have selected shows the panoramic view of the museum and adds an imposing element to the scene. Join Lou next time on one of our inspiring London Photography Tours and learn photography on the go with expert tuition. See you soon on our next London Photo Walk. Lou Smith is a Fine Art Photographer who has a passion for sharing her photography skills. With over 25 years teaching experience Lou delivers photography courses in London with expert and experienced tuition. Lou is well prepared to help you improve your photography and take photographs you love.